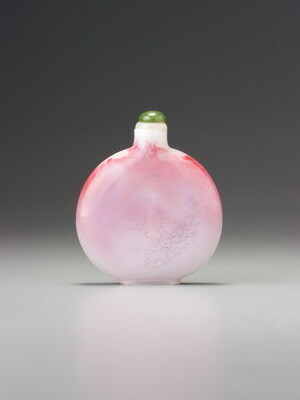 This impressive red jadeite bottle may be compared with Sale 3, lot 23, where the material is discussed. 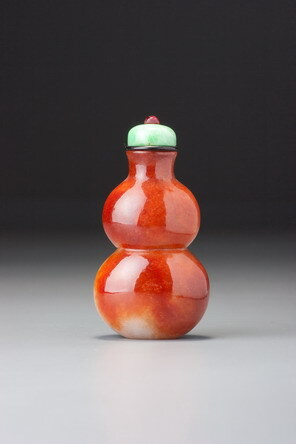 That example is obviously one of the earliest of red jadeite bottles, and this is also likely to be a mid-Qing product. There is the possibility that the other example comes from the palace workshops, but there is insufficient evidence for even a tentative attribution. Here, there are two features that suggest a possible attribution. The double-gourd form was a popular one at court during the late Qianlong period (see discussion under nos. 188 and 189 in Moss, Graham, and Tsang 1993) and probably for some time afterwards, since the influence of the emperor’s taste in jade-carving continued to make itself felt for a decade or two into the nineteenth century and Qianlong style remained influential on into the twentieth century. This bottle has the heavy foot associated with palace workshop production. It is 0.5 cm deep, and in a bottle that is well hollowed into each bulb of the gourd through a narrow cylindrical mouth almost a centimetre deep, this can only have been a matter of choice. Any carver who could perform the difficult hollowing required of a double gourd through the constrictions of such a long and narrow mouth, could very easily have continued his hollowing to match the contour of the foot had he chosen to do so. The long, cylindrical neck is rare, and it is an impressive mark of the superb technique involved in producing this bottle. The shape is elegant, with the smaller upper bulb terminating in a widely flared neck, counterbalancing the larger lower one with perfect formal integrity. The bottle itself is compressed slightly to give it two broad sides and two narrow ones, although the surfaces are a continuous curve, of course. The rich and unusually even red colour is confined mostly to one side. The work of art is a partnership between the two main languages of form and material (with its richness of colour and fine texture). The two communicate together eloquently and, as the carver so rightly realized, they do not need any surface decoration to enhance their qualities.